Please click here to sign a petition calling for an end to the Silicon Valley Community Foundation's support for radical Islamists. On March 1, the Middle East Forum revealed that the Silicon Valley Community Foundation (SVCF) has provided at least $330,524 to the Council on American-Islamic Relations (CAIR) and Islamic Relief, two extremist organizations that routinely give platforms to Islamist speakers who incite hatred against women, Jews, Christians, and the LGBTQ community. MEF's Islamist Watch project has compiled profiles and recordings of the worst of the worst SVCF-subsidized speakers. Previous installments: Siraj Wahhaj. Hussain Kamani offers the Quran as guidance on how often to beat one's wife. Kamani has spoken at numerous Islamic Relief events (e.g. a Ramadan fundraiser in 2015). Hussain Kamani is the co-founder of the Qalam Institute, a seminary and training organization in Texas. 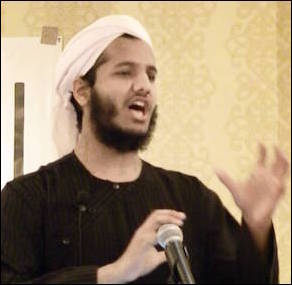 Kamani acquired his religious training in the United Kingdom. He studied at Darul Uloom Bury, one of the most prominent seminaries within the Deobandi movement – a hardline South Asian Sunni sect that gave birth to the Taliban. In 2016, The Times reported that this U.K. seminary "preaches contempt for non-Muslims and warns of the 'repulsive qualities' of Christian and Jewish women." Similar rhetoric can be found in Kamani's sermons today. One of the Qalam Institute's most popular courses – titled "The Prophetic Code" and taught by Kamani – warns Muslims to seek "cleanliness" and "purity," so as to "not resemble the Jews." Kamani also cites Quranic commentary to advise parents: "Order your children to pray at the age of seven. And beat them (lightly) if they do not do so by the age of ten." For more extremist quotes, see below. Click the play button at left to instantly hear Hussain Kamani say the offending quote displayed at right in his own voice. "And then Allah...said if a person wishes to fulfil his desires, his common desires, there are only two ways he can fulfill these desires where he will not be held responsible for it. ... How? What are the two things? ... The first thing is that he fulfills his desires with a spouse. The second thing is that he fulfills his desires with a female slave that belongs to him." "When a person that is married, or a lady that is married, if they commit adultery, their sin is to be stoned to death. Their sin is to be stoned to death." "You know, we are all quick to quote the verse in the Quran where Allah... says that, advise them, then separate with them in bed, and then strike them. We are very quick to quote this ayah. But don't we all know that the Prophet ... was a clear commentary on the Quran and that the Prophet kept that as a last measure." The British journalist Andrew Norfolk further explains: "Integration with British society is denounced. To befriend a non-Muslim risks pollution by the corrupting ways of the kuffar [non-Muslim]. Any man who considers marrying a Christian or Jewish woman is warned of the danger that 'their repulsive qualities will filter into Muslim homes'. A woman's place is in the home. Ideally, that is where she 'should remain'."